A new study, which treats these fables like an evolving species, finds that some fairy tales may have originated as long as 6000 years ago. To conduct the study, Jamshid Tehrani, an anthropologist at Durham University in the United Kingdom, and colleagues scanned a repository of more than 2000 distinct tales from different Indo-European cultures. They limited analysis to tales that contained magic and supernatural elements because this category contained nearly all the famous tales people are familiar with. This narrowed the sample size to 275 stories, including classics such as Hansel and Gretel and Beauty and the Beast. Researchers have traced certain fairy tales, such as The Smith and the Devil, which tells the story of a blacksmith who makes a deal with the devil in exchange for unmatched smithing prowess, back thousands of years—all the way to the Proto-Indo-European people. If the analysis is correct, it would mean the oldest fairy tales still in circulation today are between 2500 and 6000 years old. Other stories seem to be much younger, appearing for the first time in more modern branches of the language tree. In a dispatch, Mark Pagel, an evolutionary biologist at the University of Reading in the United Kingdom ruminates on what allows these stories to stand the test of time. It’s 30-feet wide, carries 150 metric tons into low-Earth orbit, and could even get you from New York to Shanghai in 39 minutes. Those are some of the audacious stats Elon Musk rattled off during a speech at the International Astronautical Congress in Adelaide, Australia, where he explained a vision for a new do-it-all rocket called BFR. Hubble observes pitch black planet — an alien world as black as fresh asphalt, orbiting a star like our Sun. Astronomers have discovered that the well-studied exoplanet WASP-12b reflects almost no light, making it appear essentially pitch black. This discovery sheds new light on the atmospheric composition of the planet. Author Taylor Bell: "The measured albedo of WASP-12b is 0.064 at most. This is an extremely low value, making the planet darker than fresh asphalt!" This makes WASP-12b two times less reflective than our Moon which has an albedo of 0.12. Bell adds: "The low albedo shows we still have a lot to learn about WASP-12b and other similar exoplanets." WASP-12b orbits the Sun-like star WASP-12A, about 1400 light-years away, and since its discovery in 2008 it has become one of the best studied exoplanets. With a radius almost twice that of Jupiter and a year of just over one Earth day, WASP-12b is categorised as a hot Jupiter. Because it is so close to its parent star, the gravitational pull of the star has stretched WASP-12b into an egg shape and raised the surface temperature of its daylight side to 2600 degrees Celsius. The high temperature is also the most likely explanation for WASP-12b's low albedo. The daylight side of WASP-12b is so hot that clouds cannot form and alkali metals are ionised. It is even hot enough to break up hydrogen molecules into atomic hydrogen which causes the atmosphere to act more like the atmosphere of a low-mass star than like a planetary atmosphere. This leads to the low albedo of the exoplanet. The new data indicate that the WASP-12b does, however, emit light because of its high temperature, giving it a red hue similar to a hot glowing metal. If the theory that "Gravity is the result of random quantum fluctuations," quantum mechanics might be more fundamental to the structure of the universe than gravity itself. Scientists have been trying to reconcile the differences between the two since the days of Einstein. They have toiled over the confusing contradictions between the macroscopic realm (governed by gravity and Newtonian laws) and the quantum universe, which rules the behavior of the super-small. Some experts have tried to bridge the chasm between quantum mechanics and gravity by introducing a concept they call “quantum gravity,” which states that gravity is wrapped up in tiny packets—or quanta. But this theory has its limitations, and physicists are still searching for other explanations. A sticky point in quantum mechanics is that it requires an “observer” of some kind—whether conscious human or not, it’s unclear—to collapse what’s called a wavefunction (a collection of probabilities) into a single reality. One solution to such paradoxes is a so-called GRW model that was developed in the late 1980s. It incorporates “flashes,” which are spontaneous random collapses of the wave function of quantum systems. The outcome is exactly as if there were measurements being made, but without explicit observers. Modern humans (at left) and Neanderthals (right) were strikingly different in many respects. Yet a new genetic analysis suggests that Neanderthals may have had an out-of-Africa migratory experience not unlike our own. How many Neanderthals were there? The archaeological record suggested that very roughly 150,000 individuals spanned Europe and Asia, living in small groups of 15 to 25 — and that their total numbers fluctuated greatly during the several climate cycles (which included harsh glacial periods) that occurred during the half a million years they inhabited Earth, before going extinct 40,000 years ago. Some gene-based estimates put the Neanderthals’ effective population at a measly 1,000; others claim they hovered at a few thousand at most (one study, for example, calculated that there were effectively fewer than 3,500 females). Two hypotheses might account for these results: that the population was indeed that low, even at its peak, or that the population was perhaps larger but had been decreasing for a very long time. In either case, the Neanderthals were always on the decline; their extinction seemed to have been foretold from the beginning. The Neanderthals struggled: The glacial periods they endured and the fragmentation of their population left them unable to support robust social or technological growth. “But the one misconception people have is that we represent progress, that modern humans are the best and Neanderthals beneath us,” said John Hawks, a paleoanthropologist at the University of Wisconsin-Madison..
“When it comes to being hunters, being reliant on high-energy food resources in marginal environments, Neanderthals were the extreme.” He added, “They solved problems we don’t face today. How did they live at such low population densities for hundreds of thousands of years? That’s something we never managed." Before doing this research, Alan Rogers, an anthropologist and population geneticist at the University of Utah, thought Neanderthals had been on the brink of extinction when modern humans entered their territories, that their populations were already dwindling and rife with genetic disease. “I no longer think that,” he said. Understanding the true structure of the Neanderthal population may help scientists dig deeper and more productively into the dynamics of those ancient people and their interactions with us. For example, Akey said, one new question we might ask about interbreeding between modern humans and Neanderthals is whether there were any sexual biases in that gene flow. Did we incorporate equal amounts of maternal and paternal Neanderthal DNA, or was the scale tilted? Researchers transplanted tadpoles' eyes to their tails to see if they would form new nervous connections allowing them to see. Researchers at Tuft’s University transplanted the eyes of young African clawed frog tadpoles from their heads to their tails in an effort to study how their nervous system would adapt. They gave some of them the drug zolmitriptan, commonly used to treat migraines, and left others alone. Although nerves are often hesitant to grow, in just under half of the tadpoles dosed with zolmitriptan, a network of glowing filamentous nerves spread from their eyes to their spinal cords, indicating that new growth. The transplantation was easy enough; at such an early stage of development, tadpoles heal quickly, and the eyes integrated into their tails with little problem. The researchers also modified the tadpoles’ eyes to produce a fluorescent protein, allowing them to trace the development of new nerves. They published their work Thursday in Nature Regenerative Medicine. The experiment was an attempt to explore how the nervous system can heal itself following an injury. NASA's Curiosity rover has been making a steady climb towards a strange Martian ridge that's captivated scientists since before the mission even started. 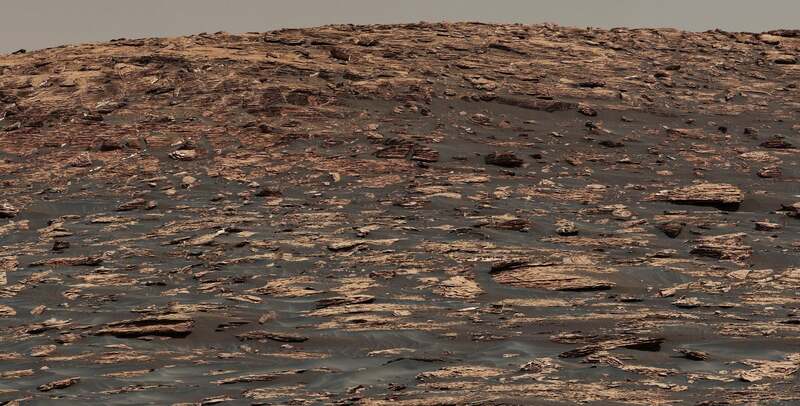 Known as Vera Ridge after the pioneering astrophysicist Vera Rubin, the durable outcrop could shed new light on the environment and potential habitability of ancient Mars. The Curiosity rover's explorations have already shown that this region of Mars once hosted an ancient lake, which is seen as a potential sign of habitability, and a possible example of what Earth looked like in its primordial days. But to observe these tantalizing features, Curiosity has some climbing to do. Mission planners are carefully selecting a route that, in addition to ensuring a safe ascent, will lead to the ridge layers that were previously studied from a lower vantage point. "As we skirted around the base of the ridge this summer, we had the opportunity to observe the large vertical exposure of rock layers that make up the bottom part of the ridge," said Abigail Fraeman, the NASA scientist who organized the rover's ridge campaign, in a statement. "But even though steep cliffs are great for exposing the stratification, they're not so good for driving up." Curiosity will have to climb 213 feet or the height of a 20 story building. The rover is now mounting a steep grade, requiring it to make a series of carefully controlled climbs across a total distance of a third of a mile (570 meters). Keep in mind that Curiosity is about the size of a car, and its trajectory is being controlled by mission planners located 250 million miles away. Keep in mind that Curiosity is about the size of a car, and its trajectory is being controlled by mission planners located 250 million miles away. "The campaign plan will evolve as we examine the rocks in detail. As always, it's a mix of planning and discovery." Scientists are at a loss to explain one of the biggest mysteries surrounding the critically endangered North Atlantic right whale — why the animals are disappearing from their usual breeding grounds off the southeastern United States. Usually, right whales spend the winter in their breeding grounds off Florida and Georgia. Before 2011, more than 200 right whales were spotted in the area each year. In 2017, there were just seven. "How tough can it be to find 200 whales? Apparently pretty tough," said Jim Hain, associate scientist at Woods Hole Oceanographic Institution, located near Falmouth, Mass. It's just one of the many puzzles these leviathans present to researchers. At least 14 North Atlantic right whales were found dead off the East Coast of Canada and the U.S.
At least 11 of those were found in Canadian waters. The mortality figure is probably larger than we are seeing," said Hain. The birthrate of these creatures has dropped by 40 per cent from 2010 to 2016, and scientists don't know why. The five calves born this year present another puzzle for scientists. They were all born to older mothers, raising the question: where are the first-time mothers? "There are big groups of juveniles that are somewhere. And where? We don't know." The remains of a Viking warrior chief turned out to be female. The anonymous warrior was buried along with her weapons, horses, and a strategy board game. For more than a century, archaeologists and historians have assumed that the remains of a person found buried along with arms and horses in one of the most spectacular graves discovered in the Viking Age town of Birka, in Sweden, belonged to a man. Turns out they were wrong. Osteology- and DNA tests now show that that he has always been a she, and she was most likely a powerful military leader. “It’s actually a woman, somewhere over the age of 30 and fairly tall too, measuring around 170 centimetres,” Charlotte Hedenstierna-Jonson, an archeologist at Uppsala University, told The Local of the findings that were published in the American Journal of Physical Anthropology on Friday. “Aside from the complete warrior equipment buried along with her – a sword, an axe, a spear, armour-piercing arrows, a battle knife, shields, and two horses – she had a board game in her lap, or more of a war-planning game used to try out battle tactics and strategies, which indicates she was a powerful military leader. She’s most likely planned, led and taken part in battles,” she said. As the Category 5 hurricane takes aim at southern Florida, mandatory evacuations have pushed tens of thousands of people northward. Mote Marine Laboratory’s new coral research facility on Summerland Key has been secured, Robert Etti, the center’s housing manager, tells The Scientist in an email. The campus’s executive director, David Vaughan, and one other staff member have stayed behind to watch over the corals. Vaughan says they took precautions, such as dividing corals between inside and outside facilities. “We have half of our broodstock genotypes split so that we do not have all our eggs in one basket,” he writes in an email. Nagi Ayad, a brain cancer researcher at the University of Miami School of Medicine, says he and the members of his lab have completed a university-issued checklist that includes backing up all their data to servers, unplugging nonessential equipment, connecting essential equipment to backup systems, and refilling liquid nitrogen tanks. One of his students felt conflicted because he was about to finish a mouse experiment on medulloblastoma. “He really didn’t want to leave without knowing the results of the experiment, because he had worked so hard for the experiment for a full month,” Ayad says.